Aquariums are marketed to families as an up-close and personal view into the lives of marine mammals and fish, but there is nothing natural about living in a tank and performing for our entertainment. 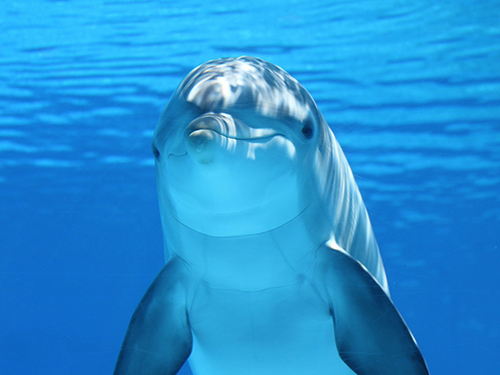 Dolphins, orcas, seals, walruses, and other marine mammals have unique personalities, highly inquisitive natures, and complex thought processes. They live in large communities and depend on each other for survival. Yet aquariums and marine parks around the world tear these animals away from their family members and place them in captivity, where they spend hours upon hours swimming in small circles or sitting motionless in tiny shallow pools. Dolphins travel in pods of hundreds, and female dolphins spend their entire lives with their mothers and sisters. Like whales, they have a sophisticated language that may even be specific to their pod. Capturing one dolphin disrupts the entire balance of these tight-knit units. Nets are used to capture females of breeding age, and the stress of being captured often sends the animal into shock. The other dolphins, who watch on in horror as one of their own is taken away, have been seen trying to save their pod members. People have also witnessed orcas shrieking in terror and following captured family members for miles. In addition to the trauma of being ripped away from their natural habitats, captivity severely shortens the length and quality of life of these animals. If you’ve seen the documentary Blackfish or pictures of whales at SeaWorld, you know that extreme isolation usually results in the collapsed dorsal fin—which happens to less than 1 percent of orcas living in the wild. Aquariums use harsh chemicals like chlorine to keep tank water clean, resulting in burning eyes, irritated skin, and even blindness. In the wild, dolphins and orcas live for decades—female orcas can live up to 90 years—but they typically survive no more than 10 years in captivity. Common causes of death include chemical poisoning, shock, stress, drowning, pneumonia, and influenza. Perhaps the most chilling aspect of captivity is that it is a form of slow torture, all for human entertainment. In order to train dolphins, sea lions, and whales to do tricks, trainers withhold food and separate animals who won’t perform. Traumatized by imprisonment, isolation, and starvation, these animals become increasingly aggressive and depressed. Some trainers have reported seeing dolphins hit their heads against their tanks or drown themselves. Take a stand for kindness by refusing to take your family to aquariums or marine parks.